We found 48 camps that match your search. Summer begins here, June 10 – August 9, 2019! With nearly 50 camps developed and led by Forsyth School faculty, Summer Discovery provides kids age 3 through Grade 6 with an age-appropriate mix of structure, freedom, and challenge. Different weekly themes allow kids to become spies, artists, engineers, filmmakers, builders, designers, climbers, scientists, performers, cyclists, photographers, explorers, and more! Summer Discovery is a place to play, try, make, be, and do – the high ropes or obstacle course, in the lab, on the stage, and on the field. Game Builders' Club: Build your very own video game from the ground up using your own art work (or ours) combined with the coding skills that you learn at camp. STEM Activities and Snap It Together: Sharpen your mind and have fun at the same time with engaging STEM games and activities. Code Drones: (Drone is included in this program.) Program and fly your own drone in our Code Drones camp, and the best part is you get to keep the drone at the end of the week! The Maryville Science and Robotics Program is an engaging opportunity for students who are interested in science, technology, engineering, and math (STEM) fields. We offer premier, cutting edge courses for students ages 4-16 with highly qualified faculty, including professors, engineers, computer programmers, and gifted-certified teachers. Snapology camps bring STEM / STEAM to life using LEGO® bricks, technology and other engaging tools. Our camps provide a fun, safe and inclusive environment for children ages 5-12 to learn about robotics, programming, engineering, art and science, and boost their problem solving and teamwork skills, all while having a ton of fun with their friends. Camps are generally 3 hours per day, 5 days per week, and range in cost from $149-$179 each. We also provide a discount to families who enroll in multiple camps. 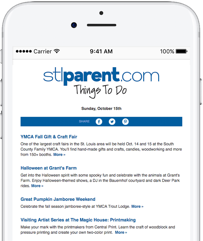 Use code stlparent20 and get 20% off your camp fee! Hurry! Offer expires April 30! Every summer, The College School offers a variety of adventures for children ages 4-15. Come experience some wonderful adventures with us and find out for yourself why our camps are so popular! We run different camps, and several fill very fast. Adventures await your child at the Endangered Wolf Center this summer. Campers will explore the world of the wolf by visiting our amazing animals, playing fun games to learn about wolf behavior, and making crafts. Exciting hikes explore nature and some of the interesting places at the Tyson Research Center. At New City Summer Camp, we're serious about helping kids experience creative summer fun and new experiences. Summer at New City School is a time of exploration and joyful learning. New City Summer Camp is designed to appeal to everyone – whether your camper wants to dance and sing on stage, explore Missouri caves, dig for dinosaur bones in our Centennial garden, conduct science experiments, create works of art, code robots, work on math problems, learn to swim, hone their soccer skills, or whatever else sparks their interest! Ackermann's Swim Program is a family-owned business that has been teaching children the life skill of swimming and water safety since 1949. We have been providing children ages 4-11 group swimming lessons in a non-competitive and safe environment in which to build confidence and self-esteem by teaching the life skill of swimming and water safety. Four different water level pools provide progressive learning in heated pools. Lavner Camps – Award-Winning Summer Camps at Wash U! Lavner Camps leads the industry in Summer Enrichment Camps and is offering Cutting-Edge Technology Camps & Creative Art Camps at Washington University in St. Louis! Campers can attend one or more weeks at any of our highly specialized camps in Robotics Camp with LEGO® EV3®, Robotics with Artificial Intelligence, Robotics Camp with VEX® IQ, 3D Minecraft™ Camp, Elite Skills Minecraft™ Camp with Java™ Coding, Esports Camps, Fortnite Camp, Overwatch Camp, YouTube Video Production Camp, and much more! See our full description for all camps we offer. COCA is one of St. Louis' premiere organizations for new artists and masters alike, creating an innovative environment for campers to learn, perform and appreciate the arts. This summer, it's the perfect place to hone creativity in a fun, exciting learning environment, with camps for kids and teens to engage new challenges. Camps available include poetry, dance, drama, sculpture, songwriting, videography and much more. Options include week-long full or half-day sessions. At Little Medical School, we believe children need to dream and discover the exciting career opportunities available to them. Through role-play, hands-on activities, crafts, and using real doctor's tools, students will learn about health and science careers. Unmask your child's creativity this summer in the all-new Camp Invention® program, Supercharged™, where children build confidence, learn to collaborate and transform their wild imaginations into epic creations. Campers in grades K-6 will learn creative problem-solving skills while coding and programming futuristic robots, uncovering ancient fossils, designing high-tech superhero gadgets and exploring radio frequencies. This is a sleep-away camp. YMCA Camp Lakewood's summer overnight camp for boys and girls ages 6-17, only 90 minutes south of St. Louis, provides a well-rounded experience for campers by getting them outdoors having fun, making friends and conquering new skills. A 360-acre lake, 5,200 wooded acres, caves and creeks create many opportunities for adventure, exploration and experiential learning. YMCA Camp Lakewood offers four-day, one-week and two-week camp programs, and also ranch, leadership and wilderness programs, with optional electives, including high adventure, advanced arts & crafts, paintball, SNAG golf, horsemanship and more. J Day Camps offer the most for your summer: traditional camps, art camps, STEAM camps, teen camps, preschool camps and specialty sports camps offering gymnastics, baseball, basketball, lacrosse and a ninja obstacle course! Plus, swimming, lunch, field trips and pre- and post-care. The J has a camp for every kid, and every kid is welcome at the J. 2019 Camp Dates: May 28–August 9. What Makes J Day Camps the Best? A perfect blend of summer fun and educationally based creative training! Your child will work with professionals in the arts and experience activities in music, art, robotics, engineering, dance, drama, musical theatre and circus with indoor and outdoor classes in their age groups. This year's workshops will each be centered around a theme found in one of Dr. Seuss' classic books! DaySpring Arts & Education is a unique and creative environment where students can be well equipped in the discipines of both performing and fine arts. Have a blast at the Saint Louis Science Center's Summer Science Blast Summer Camp! Weekly day camps provide children ages four to sixteen learning experiences to develop their interest and passion for science. We aim to provide a welcoming and engaging learning environment that ignites and sustains critical thinking and creative problem solving throughout the summer. This year marks the 50th anniversary of the Apollo 11's historic trip to the moon, and our camp theme for the summer is "One Giant Leap." Crayola World of Design Camps take kids on a journey of discovery! This one-of-a-kind art camp allow kids to experiment with new art techniques while working on their problem-solving skills at the same time. Kids get to explore art and design as a career path and as a tool to understand different cultures and places. Community School offers camps for 3-year-olds to eighth graders, including arts, academics and just plain summer fun on the school's beautiful 18-acre campus. Expanded mini camps include over 80 offerings, with special sessions from COCA, Bricks4Kidz, Little Medical School and more, including partnering with STAGES again for three musical theater camps. Plus, there's Play Camp for our youngest campers and FUNdamentals to fight the summer slump. Bricks 4 Kidz offers LEGO building camps and Robotics camps for ages 4-12. Our camps are 5 days, 3 hours a day and offered all around town, so sign up for a camp near you today! Yucandu Art Studio believes that when you give kids great materials, they make GREAT art! Yucandu is such a fun and inspiring place to be and the camp projects are so cool! Send your child to a place where they will grow as a budding artist, feel successful, and bring home artwork. Yucandu campers say: "That was the best camp ever!" What kind of summer do you want your kids to have? Whatever your answer is, you'll find it at Saint Louis University. SLU offers more than 60 camps and academies for Pre-K through high school students. From perfecting their jump shot in basketball camp to hands-on experience in our medical academies, there is bound to be something that sparks your child's interest and leads to their best summer yet. Get ready for a summer of adventure! Camp Westminster offers a variety of half- and full-day summer camps for boys and girls in grades K-9 during the month of June. The staff includes dedicated and enthusiastic Westminster teachers, coaches and athletes who help campers strengthen and develop their God-given skills. STAGES Performing Arts Academy offers an exciting variety of Musical Theatre camps, workshops and productions for students of all ages and abilities, all summer long! Chess Summer Camps are the perfect way to introduce the game of chess to new students, deepen understanding of the game for established players, or offer intensive instruction for aspiring chess masters. Grandmaster instructors provide daily lessons, puzzles, and play to help guide students through each session. SING + DANCE + ACT = FUN this summer with LifeLight Youth Theatre! LYT summer performing arts camps offer a unique combination of education, performance and community. Camps are divided by age group, and we have half-day and full-day camp options. Why LYT: In our 20th year of providing youth performing arts programs, we have a unique program that balances the best of quality performances with critical theatre education and community. We strive to offer the best instruction and reasonable tuition, so you can enjoy a whole summer of LYT for the cost of one camp elsewhere. All registered campers receive a summer camp t-shirt (if registered before May 1). Dream it, build it, wreck it, repeat it in our LEGO-inspired engineering camps! Campers learn about science, technology, engineering and math while playing with LEGOs. They'll engineer interesting projects, engage in critical thinking, work collaboratively and explore STEM concepts. Let your child's imagination run wild with over 20,000 LEGO pieces. Camps include themes such as Star Wars, Minecraft, Harry Potter, Super Heroes and Robotics. Learn new songs and singing styles, play music-related games, make new friends, and gain performance experience with the St. Louis Children's Choirs' Summer Singing Camps! We offer three camps, Sing Out Summer Camp for third-sixth graders, Acappellooza Jr. A Cappella Camp for sixth through eighth graders, and High School Vocal Jazz Camp. Make your child's summer magical with a one-of-a-kind camping experience at The Magic House. Campers participate in fun, educational activities, explore The Magic House and more. Weeklong, half-day camp is available for ages 4 to 5 and 6 to 8, plus a full-day program is offered for kids ages 8-11. From embarking on artistic adventures to unleashing their inner inventor, Camp Magic House has something sure to spark your child's imagination this summer. Andrews Academy Summer Camp is an activity filled, all-inclusive day camp for children entering kindergarten through 6th grade. Fun experiences tailored to the child's interests include sports, outdoor recreation, crafts, cooking, performing arts, science, technology and explorers. The weekly fees include before and after care, breakfast, lunch, snacks, awesome field trips, and all supplies. Daily swimming in our guarded outdoor pool rounds out the full camp experience at the Creve Coeur location. Learning through play in the arts is what Metro Theater Company (MTC) Summer Camps are all about! MTC's young artists are taught by dynamic professional teaching artists who actively work in the St. Louis arts community. Middle and High School students will explore acting and audition techniques, playwriting, stage combat, and more at any of our three Grand Theater Camp programs. Younger artists enjoy fun filled days at Creative Arts Camp. Artscope's Summer Camp Create features expert visual art instruction by experienced artists, visits from special guests, lots of screen-free outdoor play, and supervised exploration of magical Tower Grove Park. We emphasize reducing our footprint by using natural, recycled and upcycled materials for our art. We offer 10 total weeks of summer fun! Some of our 2019 camp themes include Time Traveler Academy, Mural Magic, and our STEAM-themed camp, Scraptopia. Does your child dream of being a scientist? Robotics engineer? Secret agent? Mad Science provides fun, hands-on science camps for ages 5 to 12 at locations across the St. Louis metro area that will spark your child's imagination this summer! Mad Science of St. Louis offers more than 35 week-long camps that allow your child to touch, see, hear, smell and taste what science is really all about. This hands-on approach not only teaches children about the wonderful world of science, it also gets them excited about applying scientific concepts to real-life situations. Looking for something AMAZING to offer your kids over summer break? Send them to Ultimate Ninjas Camps, where they will learn how to tackle obstacles as seen in the hit TV show American Ninja Warrior. At Ultimate Ninjas, we instill self-confidence, acceptance, and a true hunger for tackling obstacles with a positive mindset. The best part: we have a BLAST doing it! Led by 3-time American Ninja Warrior competitor Kirsti Pratt, you will not find a more positive environment where kids can show up, be valued for exactly who they are, and discover what they are uniquely capable of achieving. Aspiring astronauts, scientists and engineers ages 8-18 will have a "blast" at the award-winning Challenger Learning Center where they can explore space, science, art, and technology through simulated space missions and other out-of-this-world activities. Space adventurers can travel to the Moon or Mars, explore Comets, or train in an underwater environment in SCUBA gear. Bear Pole Expeditions is changing the world through transformative outdoor adventures, one camper at a time. At Bear Pole, we have been offering fun, safe, exciting epic adventures for more than 50 years. Campers age 11-17 are invited to join us in exploring pristine wilderness and experiencing the thrill of outdoor adventure with new friends. From the Rocky Mountains to the Olympics, from the Colorado River to the Pacific Ocean, join campers from across the US and around the world for the most amazing summer adventures you ever imagined. There's something to be said for longevity, and Vetta Sports Summer Camps have been around for more than 25 years. Simply put - we play sports and have FUN. As part of their summer camp experience, your child will discover a variety of activities, including classic sports such as soccer, basketball, tennis, racquetball and kickball. But the fun doesn't stop there! Campers also learn innovative team-building skills, play archery tag, jump on inflatables and get creative with arts & crafts. Special guests educate and entertain kids with animals, introduce science concepts, teach athletic skills and much more. Plus, we go on awesome field trips! Register by April 15 to get the early bird discount! Join the Craft Alliance Center of Art + Design Staenberg Summer Camps 2019, for ages 4-18. Join us for fun activities and create art experiences for children and teens. Campers can explore techniques in clay, glass, graphics, metals, wearable art, textiles, and more! We offer 11, one-week, half-day camps from May 28 through August 9, campers can also stay all day long with supervised lunchtime. Before-care (8:30 a.m.) and after-care (until 5:30) are available for an additional fee. Bring your imagination, passion, creativity, curiosity and talent and join us for an exciting summer! Parkway-Rockwood Community Ed offers a variety of full-day and half-day camps, clinics and classes for youth and adults in the following areas: adult education and literacy, aquatics, enrichment, outdoor education, school-age care, sports, and visual & performing arts. You do not have to be a Parkway or Rockwood resident to participate in Community Ed summer programs. Use code COMEDSUMMER when you register and save 10%! Register by May 1 to get the discount. All American Gymnastics & Super Ninja offers day camps, preschool camps and two specialty camps this summer. Gymnastics & Ninja Training. All of our camps will spend the majority of the day in the gym, allowing children to be moving and getting exercise while having FUN! PlayFirst is a unique year-around youth soccer program that caters to kids 4-11 years of age. The program is designed to teach the game of soccer in a very creative and dynamic manner. Kids will experience the "fun-factor" of playing the game they all so desire, but the games and activities within the PlayFirst program curriculum will, intuitively, teach these players skill development, as well as a creative way of thinking and playing the game. Calling all young pet lovers ages 10-14! Come work alongside the Purina Farms trainers and their amazing canine athletes and learn some of the most popular canine sports! Campers will learn from the pros how to train a dog in the sports of Freestyle Flying Disc, Diving Dog and Canine Agility, and learn responsible pet care through games and service projects. Campers will take home group photos and individual photos with adoptable dogs, take wagon rides to the Purina Event Center, and will each receive a flying disc and certificate signed by professional Purina Incredible Dog Team Trainers. Looking for a one-of-a-kind summer program for your kids? Check out Camp KangaZoo at the Saint Louis Zoo, where campers learn all about Zoo animals! Campers have the opportunity to see and touch live animals, attend a Sea Lion Show, hop aboard the Zooline Railroad, tiptoe around the Zoo at night and sleep overnight at the Zoo. Camp Whitfield is a day camp is conveniently located on Whitfield School's campus at the corner of Mason and Ladue roads. Children entering kindergarten through seventh grade will participate in a variety of engaging activities filing their summer days with fun. Each day, campers participate in technology-based activities, unique art experiences, fun crafts, sports, and games. Whitfield School also offers five sports camps. What better way to spend the summer than outdoors! BablerWiLD Summer Programs offer full-day and half-day camps and classes that bring science and nature to life at Babler State Park. Check out WiLD Adventure Weeks that take place during the first and last week of summer that feature field trips and choice activities, and the WiLD Survival Academy for middle schoolers who love spending time in the outdoors. From hiking to fire-building there is something for every nature lover.